This French hit, the story of a rich paraplegic white man who forms an unlikely friendship with an unrefined black caretaker/assistant is the stuff Stanley Kramer movies, TV after school specials, a number of politically correct 80’s sitcoms or perhaps even a cinematic version of the McCartney/Stevie Wonder song, Ebony and Ivory. That said, the dated racial and class characterizations and on-the-nose sentimentality are evened out by the genuinely warm and authentic performance trump of Omar Sy. I first became aware of this picture when we heard about Omar Sy besting Oscar-winner Jean Dujardin for the Cesar Award for best actor last year. But the poster of the handsome faces of Francois Cluzet and Sy wearing non-threatening smiles generated little interest for me. Sure, we shouldn’t judge a book by its cover but this seemed milquetoast bland. It turns out what we see on the screen is not that far off from the poster. Cluzet plays Philippe, a parapalegic millionaire, bound to a wheelchair for the rest of his life, but with enough money to hire full time assistants to aid him in all his endeavours. Enter Driss (Omar Sy) who interviews for the job, a African man from the wrong side of the tracks, in over his head in the world of stuck up French aristocrats and jet setting business men. As we expect Philippe admires his naïve unfiltered candor and thus shocks his confidents when he hires the unexperienced and uneducated Driss. But there’s something about Driss’ candid nature and forthright attitude which Philippe is lacking in his white collar, stuck up sheltered life. And so, we see Driss entering society-life, pushing Philippe to look outside his literal and figurative shell and discover the true meaning of life. Humour is derived from Sy’s fish out of water exploits, his ill-mannered passes at the gorgeous redhead assistant, and his naivity when it comes to refined culture such as the opera, art and classical music. For Philippe he gets exposed to R&B music, the freedom of urban soul dancing, marijuana and fast cars. The filmmakers leave nothing between the lines hitting us over the head with its pandering social commentary not that far removed from Diff'rent Strokes, Driving Miss Daisy or The Blind Side. Thus, it’s no surprise the film was massive success in France, a strong Weinstein-aided indie hit in North America, and soon to be remade in Hollywood. But masses up people also like white bread and Bud Light. 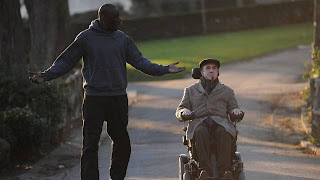 The Intouchables is the foreign cinema easy-to-digest. Remarkably this picture is rendered most significant for the breakout performance of Omar Sy, a man with a large screen presence with his inate big screen charm and affability as a younger Eddie Murphy. We’d all love to have an Omar Sy in our lives.